With eight lakes and the Erie Canal, Cayuga County has more freshwater coastline than any other county in New York State making it a recreational destination for families with kids of all ages, but that’s only part of the story…. Our lakes and scenery are a big part of our region’s riches, but we also have world-class museums and vibrant towns and villages full of interesting things to see and do. Check out these top kid-friendly activities and start planning your next Finger Lakes family getaway. Some museums are all about show and tell, but the Ward O’Hara Agricultural Museum is one where kids can learn all about the history of agricultural by touching and feeling. Their special events feature live demonstrations, wagon rides, crafts and more! The sport of stand-up paddleboarding is sweeping the nation, and Owasco Lake just south of Auburn is an ideal place to try it. Owasco Paddles, located in Emerson Park has canoes, kayaks, Hobie pedal kayaks, paddle boats and stand-up paddleboards for rent. Their helpful staff is available seven days a week to help get you started on your paddling adventure. Finding an affordable and kid-friendly place to stay in Cayuga County is not a problem. The Hilton Garden Inn - Auburn offers a “Family Fun Package” and the Holiday Inn – Auburn offers “Kids Eat Free” and “Kids Stay Free” options (with restrictions). Both properties feature an indoor pool and are near by lots of things for kids to do. Whether you want to take your kids for a balloon ride or to the Drive-In movies or for a game of miniature golf, Cayuga County in New York’s Finger Lakes Region is tons of fun for the family. 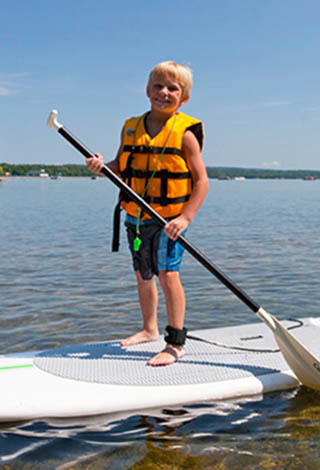 Visit www.tourcayuga .com for more creative kid-friendly ideas.